My Beauty Diary, not for facial sheet masks anymore! My Beauty Diary is a Taiwanese company that put cute facial sheet masks on the map. The company started out with a range of various sheet masks and have since tripled their offerings with various formulas. Most recently they started introducing skincare to their line up including an eye makeup remover, facial cleansers, and a scrub. The brand most recently introduced a new range of Sleep Concentrate Gels. Let’s take a look at one! A gel moisturizer that can be used in the day or evening. My Beauty Diary Rose & White Sleep Concentrate is one of three new gel moisturizers that server two functions. You can use these concentrates as a daily moisturizer or in the evening as a sleeping pack. Allowing for two functions gives the product the added benefit of being a nice multitasking skincare product however I do think it has a few quirks. 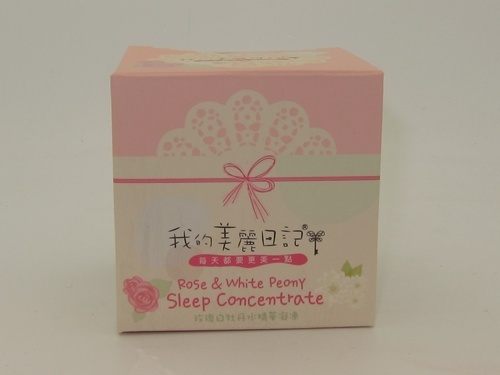 My Beauty Diary Rose & White Sleep Concentrate has a beautiful rose scent that’s very pleasant however those sensitive to scented skincare or floral fragrances may wish to avoid. I found the gel-like formula a bit on the thin, runny side but it manages to absorb easily and feels refreshing and cool on my skin. This particularly concentrate contains rose and white peony essence plus something called Aquaxyl which promises to replenish moisture in the skin while increasing it’s ability to retain it. For me the formula feels like they took a facial sheet mask and squeezed out the essence and simply bottled it up….it has the same runny consistency and feel on my face. This comes in a sweet lace embellished jar and is pink in color. It includes a small spatula so you don’t have to use your fingers to fish out the moisturizer. Packaging is cute but it does have a certain cheap, flimsy feel to it. To use as a daily moisturizer simply apply a thin layer on your face and press the palms of your hands against your face to allow the product to absorb. As a night treatment do the same but apply a thicker layer. I like the lightweight feel of the product and how easily it absorbs. Oily skin users will rejoice in the lighter texture which provides just the right amount of hydration sans a greasy, oily feel. Sadly, I honestly experienced nothing great in terms of hydrating results with this. Yes it absorbs easily, no it does not leave a greasy, oily feel, yes it feels lovely on my face however…. My skin is awfully dry and this simply doesn’t cut it in terms of hydration even when using it as a night treatment. I’ve tried and used far better Asian gel moisturizers and sleeping masks that produced far better results. The promise of helping skin to retain moisture is sadly a no go for me…after day or night use my skin still feels quite parched and dry. Those who live in a humid, hot climate (the lightweight formula will lightly hydrate skin and keep it from looking or feeling greasy). Those who have oily skin in need of a lightweight moisturizer. Those seeking long term moisturizing effects. Those looking to increase the moisture that their skin can retain. Those wanting a nightly treatment to sooth and hydrate drier skin. Those sensitive to scented skincare. Those who may have broken out in the past using My Beauty Diary Sheet Masks (the formula of this gel feels like the same essence found in their sheet masks). My Beauty Diary Rose & White Sleep Concentrate might be a nice pick for Summer or warmer weather or even for those with oily skin…however, if your skin is drier or you suffer from drier skin in the Winter this won’t quite fit the bill for easing that dryness. I was pretty disappointed as in most cases I am normally very pleased with the results of gel moisturizers from Asia however this one seemed to do nothing at all for me. I can see myself possibly using it as a prep prior to foundation or even in the Summer when my skin gets a bit oily and needs a lighter moisturizer but in regards to actually providing lasting hydration, well, it definitely didn’t work in that aspect. I think oily skin users might just benefit but those with dry skin might wanna skip! 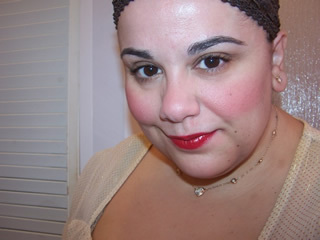 Know what’s interesting about My Beauty Diary? I did some research into the company and it’s owned by 7-11! Home of the slurpee! They’re huge in Taiwan and apparently they’ve segued into beauty products as well. Interesting, right? that would explain my 7/11 sells the product in store LOL! I thought 7/11 in Asia was owned by a different company than here in the US. Hmmmm, either way that’s cool to know. You bought this in the US 7-11? So lucky! The only store in england that sells asian cosmetics is in china town, and they charge maybe 7x the price.. (a canmake cream cheak was £25.. ($40?)) Ordering from the internet is annoying, as my bank account has been in the minuses for a year and i cba to put money in..
no lucy, they don’t sell these in US 7-11 🙂 only in asia hun.